A council is saving thousands of pounds and generating extra income by removing pay and display parking machines and shifting to cashless payments. The move is part of an objective of Reigate & Banstead Borough Council to become financially self-sufficient by 2020. The council saved £60,000 by not replacing 16 machines at a cost of £3,750 a time and avoided a further £2,300 expenditure in six months through reduced cash collections and processing. It is also benefiting from an increase in parking income of almost £56,000 from motorists moving to RingGo. While removing machines has been the greatest driver of behaviour changes, the council has supported the move to cashless parking with promotional activities. Jacquie Joseph, Reigate and Banstead’s parking and business support services manager, said: ‘We’ve been delighted at how successful this RingGo campaign has been. The return on investment has been astonishing. With just a few thousand pounds we’ve made savings worth 20 times that, and increased revenues by a similar amount too. Cobalt Telephone Technologies, the company behind RingGo, said motorists find that the ease of using cashless parking means they stay longer, and the average transaction value is now 6% higher than it was six months ago. 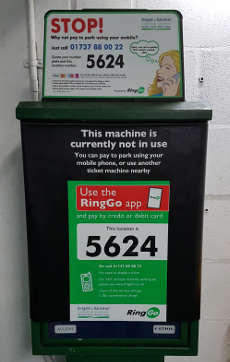 RingGo allows drivers to extend their parking sessions remotely and the number of such extensions in Reigate & Banstead has increased by 50% since the previous period.